The Blackthorn Key by Kevin Sands started my 2016 reading year off with a bang (pun intended). Published Sept. 2015, I kept seeing the cover and being drawn back to it along with the intriguing summary, but I'm not typically one for non-fantasy, historical fiction. I discovered a free sample in my local bookstore, read it (devoured it more like) and immediately bought it. Like I said, it's not fantasy, but it certainly feels magical enough because of the way Sands weaves together elements of the apothecary profession, Restoration Era London, and alchemy, as well as the wonderful cast of characters that I can't wait to catch up with in book two. Adding to the richness of the story, the book is deliciously dotted with mentions of specific foods (TBK menu here). At one point, the main character and his best friend have money to blow at their local Oak Apple Day festival, and one of the things they decide to buy is "orange icy cream". So the shilling went. I spent the first four pennies on two orange icy creams, as promised. The confectioner even let us make it ourselves, Tom furiously cranking the handle that churned the cream, milk, and sugar with the orange water in a bucket immersed in salted ice. 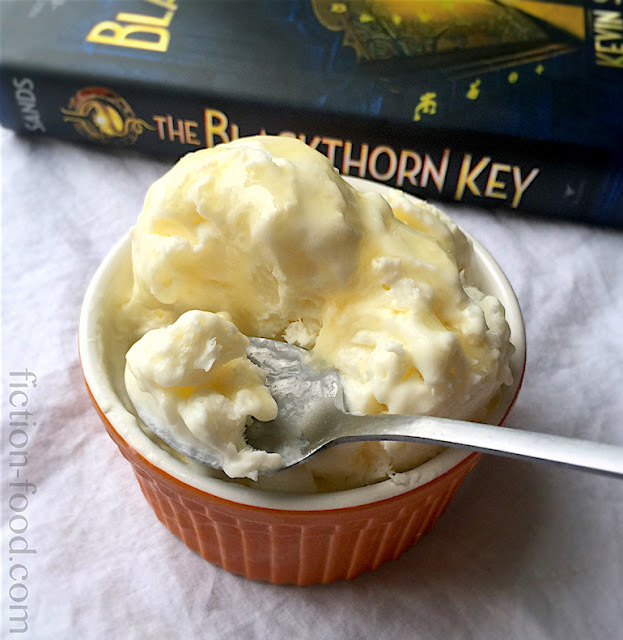 It was so tasty, I bought a third icy cream for us to share, dripped this time with honey and lemon. 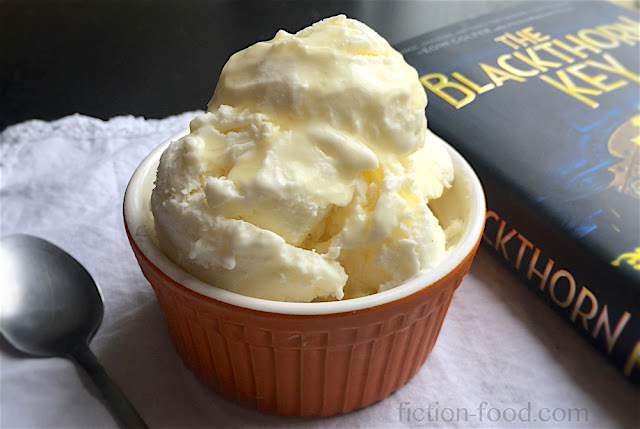 For more information on the history of "icy cream" please check out "The Scoop on Ice Cream" on Gastropod (text & podcast) and Ivan Day's post "Lady Ann Fanshawe's Icy Cream" on Food History Jottings. Note: Though cornstarch isn't mentioned in the ingredients list in the book, it helps to make the dessert thick and creamy. You could also use arrowroot, tapioca starch, potato starch, or even flour. It could be omitted completely and it would still turn out fine, becoming more "icy". Also, if you don't have an ice cream maker, you can pour the mixture into a chilled bread pan, put it in the freezer, and stir it well about every 30 minutes for about 2 - 2 1/2 hours, or until creamy. 1. In a medium pot combine the milk & cream. Scoop out 1/2 cup & put it in a little bowl with the cornstarch & stir until the mixture is smooth, no lumps remaining. 2. Add the sugar & salt to the pot & heat it on medium-low, simmering until the sugar dissolves. Remove the pot from the heat & stir in the cornstarch mixture. Return the pot to medium-low heat & stir constantly, scraping the bottom so no clumps form. Heat until the mixture thickens, coating the back of the spoon. Remove from heat. 3. Stir in the orange water & then pour the mixture into a freezer container, covering it with a sheet of plastic wrap touching the surface of the mixture. Let it cool on the counter for a little bit & then place it in the freezer to cool completely (leave for about an hour, & then stir & leave it for another hour). 4. Pour the chilled mixture into your ice cream maker & churn until thick. Scoop the mixture back into your freezer container & let it firm up in the freezer for a few hours. When you're ready to serve the icy cream, let if soften on the counter for 5 minutes or so if needed. Combine the honey & lemon juice to drizzle on top of individual servings of the ice cream. 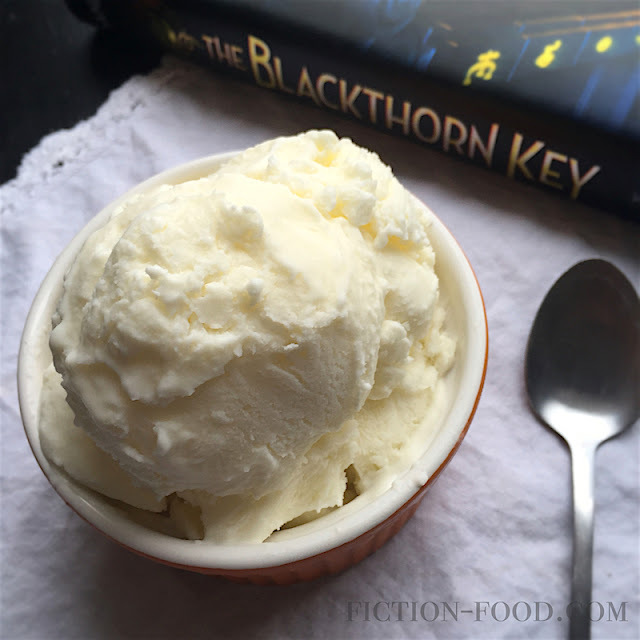 I recently started a youth book club, and this past weekend we had a Blackthorn Key party! Click here for a recounting including cookies, apple pie, edible rolling pins (how-to here), secret codes, and homemade vapor rub and slime! Thanks for giving and sharing your lots of books for delicious foods recipes given with your orange icy cream. I just recently started to use some tips from your book and it was nice to learn about some special food recipes!